It’s time to forget the sage advice of Master Yoda and give in to the dark side. 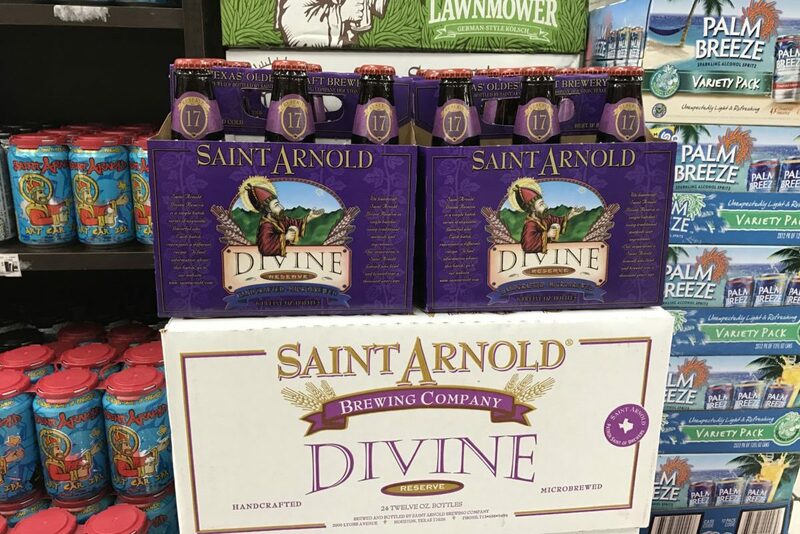 Saint Arnold Brewing Company released the 17th installment in its Divine Reserve series this past Monday. It’s a heavily malted and roasted Baltic porter that’s as dark as a moonless night. This marks the first time that a porter has been brewed as a Divine release, and only the third ever released by the brewery. The other two, 2014’s brown porter and 2016’s coffee porter, were both part of the Icon series. Despite still having a large and dedicated following, the hype surrounding the Divine Reserve series has died down from the peak a few years ago. This can be attributed to three distinct events: expanded production since moving to the larger brewery, relaxed TABC laws that now allow the brewery to announce when and where to find the beer, and the exponential growth of locally brewed craft beer across Houston. Before the brewery expanded to its current location, devotees would line up outside at the downtown Spec’s on Smith Street at 7 a.m. (or even earlier) to ensure they’d be able to buy a limited quantity of Divine Reserve. The wait in line wasn’t as bad as it sounds, though. It was an opportunity for enthusiasts to meet like-minded people and talk about beer. Employees from the brewery often joined the waiting fans and would even bring donuts and coffee. After their purchase, many Divine Reserve fans would then drive around the city and participate in “the hunt,” updating each other via social media on locations that had inventory left or businesses that had just tapped a keg. (As the saying goes, it’s always 5 o’clock somewhere!). These days, it’s not mandatory to wait in line to score some DR 17. There is still plenty on the shelf a week after release, which would have been unimaginable just a few years ago. Instead of taking a vacation day this time, I simply kept an eye on the local H-E-B Beer Department on social media and showed up during my lunch hour for their noon release. A small line of 10 or so had already formed; however, there was no shortage of supply. Thanks to past experiences with large crowds and high demand, many retailers still limit the quantity that an individual can purchase—in this case, one six pack ($14.99) and two 22-ounce bomber bottles ($7.99). True to form, everyone in line purchased the maximum, excited to finish the day and pop the top. Immediately upon opening, the strong aroma of coffee, chocolate and caramelized sugars tingle the nose and alert you that something special lies ahead. Initial tasting notes are toasted nuts, strong coffee, and dark, sugary fruits like dates and figs. Take small sips and allow the beer to warm a bit, for when the chocolate comes to life, the beer truly shines. Darker beers like DR 17 are best suited for colder weather, as the 9.2% ABV is more than enough to keep a person warm. Aging this beer in a dark, temperature-controlled environment will soften the alcohol notes and highlight the chocolate. Currently, Divine Reserve 17 is still available at neighborhood grocery stores like H-E-B and Krogers, or you can find it on tap at Petrol Station, Flying Saucer or paired with a slice at Barry’s Pizza. There are special tapping events this week around the city. Information can be found at the Saint Arnold web site. So throw caution to the wind and join the dark side: the chocolatey, nutty, and delicious one. Sir; nice review. I will await your next. Great article, you know your beer and can’t wait to read more. Mmmmmm….toasted nuts and coffee in my beer! I love the 17th DR porter, so yum!